As much as the tradition calls potato fries French fries, they are actually not from France, but originally from Belgium, with the mussel fries combination called “moules frites”. 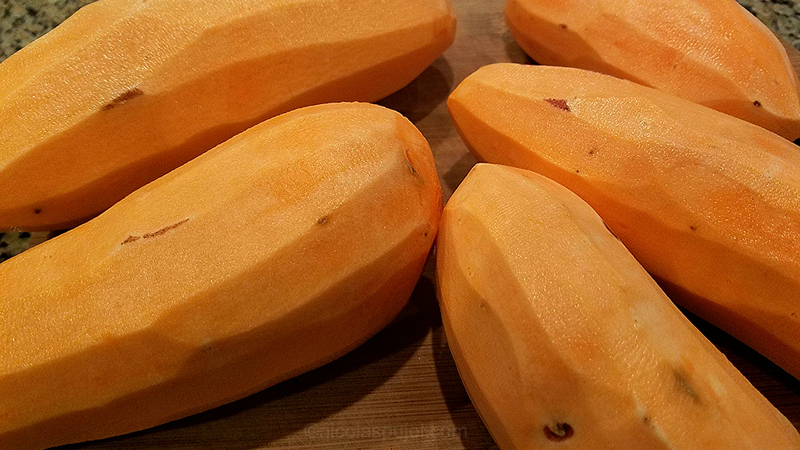 At any rate, sweet potatoes have the advantage of providing vitamin A, so you’re eating carbs – no doubt, but unrefined, unprocessed carbohydrates which contain nutrients. Today we did sweet potato fries for lunch. Sweet potatoes also taste quite good. You can make them using deep frying with lots of oil. 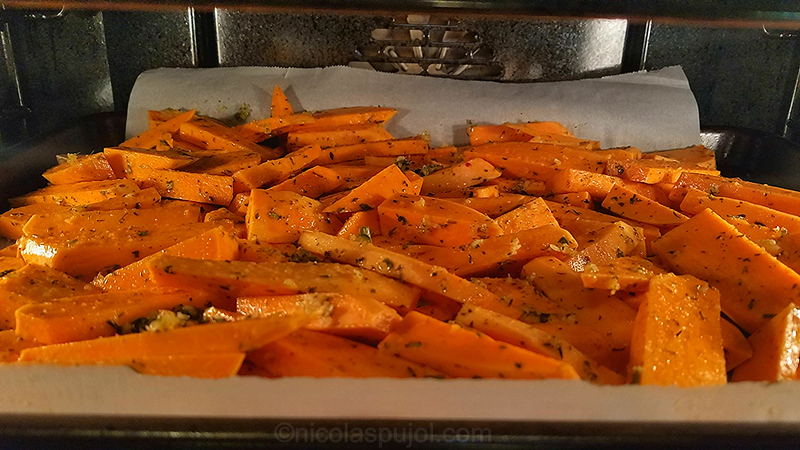 In this recipe, I attempted to use less oil and baked the fries in the oven. I chose avocado oil, for its high smoke point, while my wife Layla likes to use either avocado oil or olive oil for cooking. 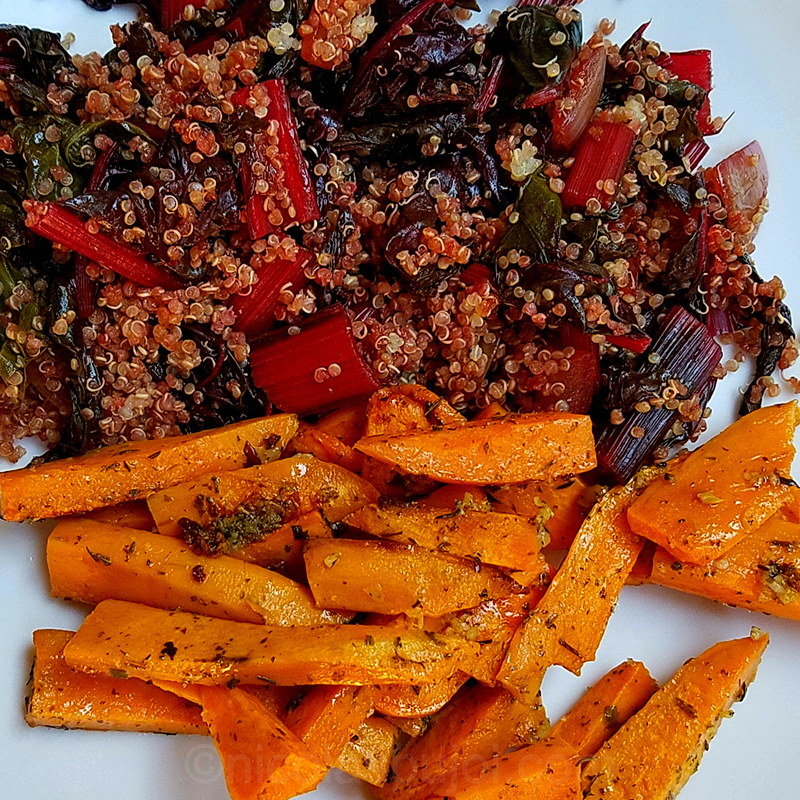 Fries are vegan, and we paired them for lunch with rainbow chard seared with yellow onions and topped with a bit of quinoa. This worked perfectly. Since I already had the quinoa cooked and ready to go, the meal was quick and easy to make. 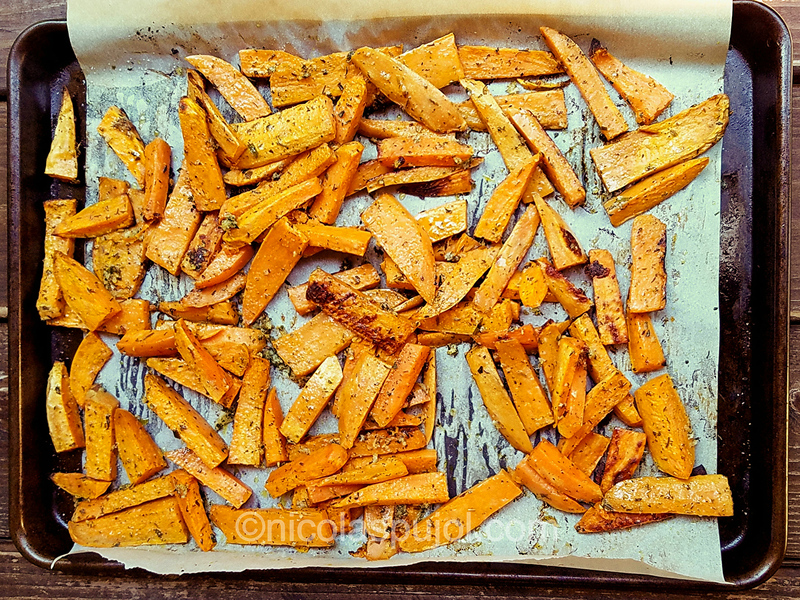 Check out also the oil-free sweet potato fries recipe, done in an air fryer (works in the oven also). 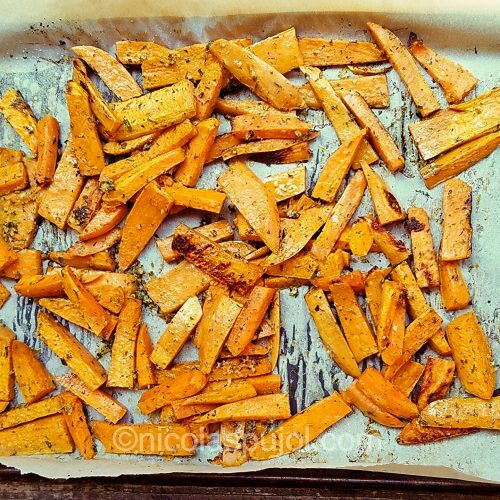 If you find yourself on a day doing sports, these sweet potato fries can be great as a pre-workout meal. But in my view they are even better for post workout to replenish your muscle glycogen. Check the workout recipe list for more on this topic. 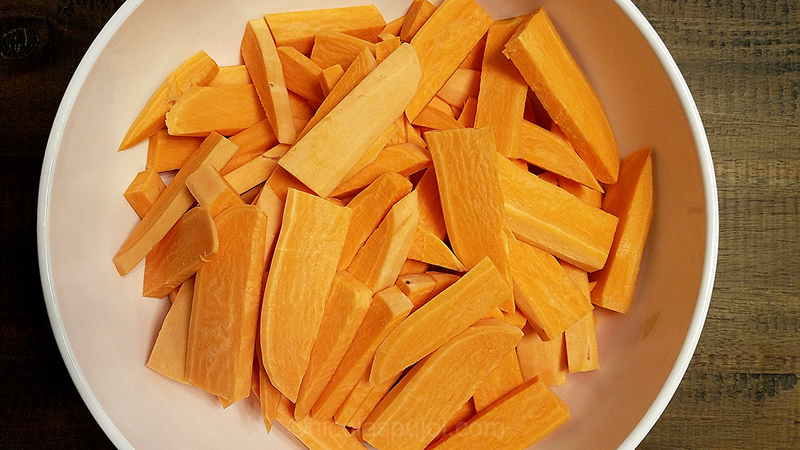 Peel, rinse and cut the sweet potatoes in fries size slices. In a large bowl, place the raw fries and add the oil, crushed garlic, herbes de Provence and salt. Mix with your hands for the flavors to spread evenly. Place a sheet of parchment paper on a flat metal container, and spread the fries from edge to edge. Bake for 30 minutes, serve warm or cold. Replace avocado oil with olive oil if you prefer, but watch out not to overheat it as olive oil’s smoke point is lower.